Ryan Shorney/Aspen Skiing Co.Fall transitioned to winter this week at the base of Snowmass. DENVER – More than a foot of snow fell on Colorado’s mountains, where winds up to 75 mph briefly shut down parts of the state’s major east-west route through Denver and delayed flights Tuesday. Vail Pass on Interstate 70 was closed for about two hours due to the weather and multiple accidents, causing traffic to back up. A rockslide closed the eastbound lanes of I-70 in Glenwood Canyon for a time. About 18.5 inches of snow fell at the Eisenhower Tunnel on the road west of Denver, said Frank Benton, a meteorologist with the National Weather Service in Boulder. Weather spotters reported 19 inches near Silverthorne in Summit County. Winds up to about 75 mph were recorded along the eastern side of the Rockies, including near the foothills west and north of Denver, according to the weather service. Strong westerly winds delayed arrivals and departures Tuesday at Denver International Airport. Only three of the six runways were used earlier Tuesday, but five were in operation by late afternoon, airport spokeswoman Laura Coale said. Both sides of I-70 between the tunnel and Silverthorne will be closed in stages early Wednesday so crews can clear snow from lanes that have been closed for construction. Eastbound traffic will be detoured off the highway from 1 to 3 a.m., followed by westbound traffic from 3 a.m. to 5 a.m. Independence Pass near Aspen and Loveland Pass were also closed for a second day. The weather service said another round of snow will move into the northern Colorado mountains Tuesday evening. Snow was expected through Wednesday morning, thanks to “a very strong” upper-level jet stream, said Benton. The snow was welcomed in ski country, after a warm start to October. The only two ski resorts open so far in Colorado benefited from the wave of storms. Arapahoe Basin, which opened Monday, reported 8 inches of new snow, while Loveland Ski Area, which opened Sunday, said it has received 12 inches of new snow. “I woke up excited,” said Viceroy Snowmass hotel group sales employee Brian Mordecai from Snowmass Village. The Snowmass ski area reported 9 inches of snow overnight, though there wasn’t that much on Mordecai’s car Tuesday morning. 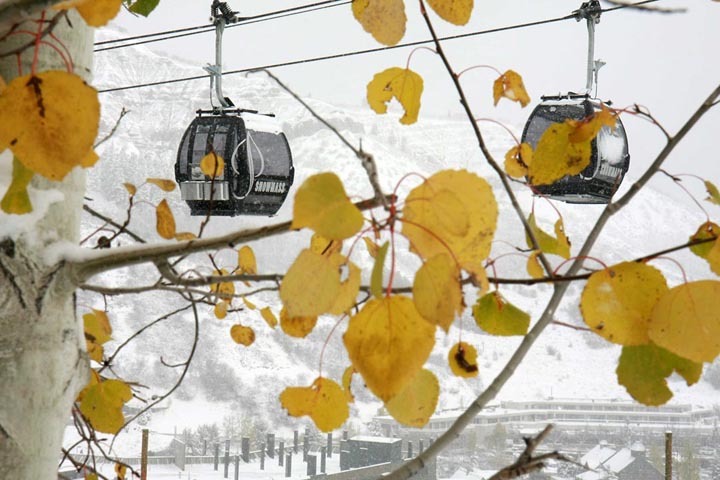 Snowmass and Aspen Mountain open for the season Nov. 25. At Keystone, snow was melting on the bottom of Simson’s pants. “According to my pants, I walked through about 10 inches to get from my car to my office,” he said. Temperatures were cold enough that the resort planned to run its snowmaking guns all night Tuesday to add to the natural flakes that were the size of a half-dollar at times, he said. The resort opens Nov. 5. While a winter storm warning for the mountains surrounding Aspen expired at noon on Tuesday, a winter weather advisory is in effect until Wednesday morning. Another 4 to 8 inches of snow is possible at higher elevations, the weather service said. Light snow continued to fall periodically in Aspen on Tuesday, and the resort has seen its coldest temperatures of the season so far. Overnight lows of around 9 degrees are forecast Tuesday night. Wednesday’s forecast calls for a 30 percent chance of snow showers, mainly before noon, with partly sunny skies in the afternoon and a high near 29. Clear skies and lows of around 8 degees are expected Wednesday night, the weather service said.